Hi! I just want to share with you my recent experience with an insurance company. On the 23rd June 2009 during the night thieves got away with my nice set of wheels for my car. I woke up to find the car supported with bricks. Although I was worried I thought since I have been paying insurance it shouldn't be that bad. I immediately got in touch with Omega Insurance company. My first shock was that I was told I will have to pay a minimum excess of P3,000 the reason being that I am in a group scheme so I kind of cover for the expenses of all the other reckless drivers in the same scheme. Though I found it unreasonable there wasn't much I could do I want my car fixed and also these are schemes negotiated for us by our administrators at work and until you experience what I did you don't usually know what they signed for. Their part of the bargain has not been forthcoming and as we speak a month down the line my car has not been fixed yet. I have been dealing with one guy at Omega Insurance (they are brokers for Botswana Insurance Company), and another person at Botswana Insurance Company and every time I call both these companies it's always excuses after another. I have also started getting quotations from other companies because I intend to leave as soon as my car is fixed. Please assist. What should I do now? It is quite normal for an insurance company to have an “excess” when you have an insurance policy. That stops you from making minor claims for every little thing that goes wrong which firstly saves them some money but also allows them to keep the premiums down a little bit for the rest of us. The lesson though is to read any insurance policy thoroughly before you sign up for it. That way you might have known about the excess beforehand. However I do think you deserve a slightly speedier response than you’ve received so far. The brokers are meant to operate on your behalf so I would apply some pressure on them to help you get this solved. I would also hassle BIC to get a move-on as well. If we can help we’ll get onto them as well for you. I terminated my lease for my flat at the end of May 2009. At the time of the termination I had not settled all my utilities. The electricity bill was on average P800 per month. I was usually only able to pay P200 – P300 per month. As such the arrears accumulated. By the time I wanted to move out of the flat I owed BPC P6,400 and Water Utilities P3,200. I had an agreement with the landlord that my security deposit of P3,500 would pay off the water bill and make an arrangement with BPC to pay off the amount owed. However, BPC having already disconnected the electricity wanted me to pay the full amount before reconnecting the electricity for the next tenant. This amount is too steep for me to pay in one lump some. But I have so far been able to pay BPC P650, which is how much I can afford to pay them monthly. A letter from the landlord on 18th July 2009 maintains that they have settled the bills with BPC and Water Utilities on advice from their legal team. Their legal team is however also “opening a file” for which they are charging the landlord P3,800 and my security deposit will pay for June's rent. I was not occupying the flat during that month. In fact the flat was under renovation the whole month for the next tenant to move in July. They state in their communication that I have to pay both water and electricity plus the P3,800 of their legal charges and other charges of P1,600. They say this comes to a total of P15,000 which has to be settled on 22nd July 2009. I don’t understand why I have to pay their legal fees. Since my deposit was supposedly used to pay off the utilities as well as the P650 I have already paid BPC it should leave and outstanding balance of P5,450. Finally I don't know what the other charges of P1600 are for. OK, let’s begin with the simple bits. From what you’ve said you shouldn’t have to pay rent for June, so long as you gave the landlord sufficient notice before you left. However, and unfortunately, all the other charges seem reasonable. I would check your lease though. Did it mention what would happen if you left with arrears? You are also clearly entitled to a breakdown of the “other charges” they want you to pay. Meanwhile at least you are trying to face up to your obligations. I suggest you speak to the landlord and see if you can negotiate a more reasonable repayment schedule. Giving you only 4 days to clear a debt of that amount is completely unreasonable. An excellent article on Slate on people's understanding of what the americans call "payday loans". I love technology, I really do. Partially it’s because I’m a boy, admittedly a grown up one but part of me is still a kid who likes toys. However I particularly love truly useful technology. My (semi) smart-phone helps me not to forget too many appointments and can also pick up my email and even surf the web when pushed. I adore my laptop and not just because it’s a sub-zero cool MacBook. I even love my wife’s iPhone, despite it being a catastrophically flawed device that Orange can’t seem to get to work properly. However, just because I love all this stuff that doesn’t mean I’m an unquestioning supporter of technology in every circumstance. In fact I’ve even done presentations to IT people with a starting slide that says, in big, bold characters “Technology is not the answer”. It’s not just a provocative statement, I truly believe it. Technology itself it never the answer to a business or personal problem. Of course it can help but the technology itself is rarely the answer. Example no. 1. Some banks have, in the past, installed silly little consumer response devices at teller stations that allow you to record how satisfied you were with the service you received. A complete waste of time. How can you summarise a service experience with the press of a button. You can’t summarise all your feelings about the temperature, the speed of service, the smile on the teller’s face, the interest rate you are paying by answering the question “Are you satisfied? Yes / No / Don’t give a damn”. It isn’t that simple. Life and service are much more complicated than that. Those devices are a complete waste of time and are simply a distraction from the real business of service. They’re also a way for the customer service people to say they’re doing their job when in fact they’re not. Example no. 2. The big one. e-Government. Our esteemed Government have embarked on an “e-Government project”. Put simply this is a way of allowing consumers, citizens, businesses, whoever, to connect to Government electronically. Maybe eventually we’ll even be able to file our tax returns, apply for replacement driving licences, all sorts of things on-line. No more will we have to queue up in Government offices to do the basics. Perhaps. I suspect not. While I love the idea of e-Government I much prefer the idea of Good-Government first. Just plastering a web site on top of an already failing process is a waste of everyone’s time. It’s just like wallpapering over a cracked wall. It doesn’t solve any problems, it just briefly hides the problems underneath. That wall will still eventually collapse. The old Government process behind the fancy new web site will still eventually collapse and fail, leaving consumers mightily pissed off. The solution is to make the old-fashioned processes work first and THEN spend money on technology. There’s no point in buying a better, faster, sexier car if you can’t drive yet. Learn to drive first, get a cheap, reliable car and then gradually upgrade to your dream car. Same with “technologising” processes. So am I completely pessimistic? Not entirely. There ARE examples of where technology has worked very nicely. My favourite at the moment is the new Government food basket system. In the past the destitute and another groups steeped in poverty have been given food baskets by our benevolent government and quite right too. It’s one of the few real jobs of Government: to assist the utterly poor to get out of poverty. However, as anyone connected with the old system knows, the process was deeply flawed. People were given what Big Brother decided they should have and often ended up with rotten, expired goods. The system was also horribly corrupt. I’m sure many of us have heard the stories of the bribes, the theft and the abuse. So Government did something sensible. They didn’t change the basics, people still get the food but they are now getting it in a MUCH better way. Now, each person entitled to the aid gets a smart card that they can use like a bank card in certain, selected stores. Their card is credited with the value of the food they’re entitled to receive and they can then spend it as they see fit. If they want rice rather than maize meal this month then they can make that choice. If they need vegetable oil rather than milk today then that’s their decision. That’s perhaps the biggest change the new system has brought. Choice. Choice is almost always something available only to the more affluent sections of a community. Rarely are the poor given choices but this is an exception. For perhaps the first time the authorities are allowing people to take a little control over one of life’s essentials, the food we eat. Of course it’s possible that some recipients of the aid will make poor choices. In theory they could spend everything on chocolate and magazines but that’s their choice. However I doubt that this will happen very often. Naturally there have been teething problems, that’s the case with anything technological. Anyone reading the papers will have heard of the occasional store that has been trying to fool or exploit the system. However, and this is a big change, now the crooks can be identified. With the old system the theft and corruption was hidden, now it’s in the open. If I was a betting man I’d put money on there being truly massive savings because of this new system. That’s money that we can either save or spend on delivering aid to more needy people. I think we should celebrate a rare occasion when modern technology has been used to genuinely benefit the people, not just to waste a whole lot of cash on technological toys to please little boys like me. Priscilla and Lindy from FNB for excellent service. There was an advert in a local newspaper, claiming to be to be from Transitions Abroad and is looking for workers offering salaries up to US$8,000 a month. Going onto the website it looks like the website is a portal for work, volunteer and study abroad programs and not a job search service. a) The e-mail address that looks suspicious is transitionabroad@gmail.com when the contact listed on the website use the domain @transistionabroad.com. c) payment of a service fee upfront instead of after you land the job! I'd like to ask Consumer Watchdog to possibly follow-up on the advert and confirm it is on behalf of Transitions Abroad). I fear some innocent Batswana looking for jobs under these economic conditions may lose their hard earned cash to yet another scam. We need more people like this consumer. Clearly someone with a skeptical mind and who is willing to do a little detective work on behalf of other consumers. Few things give me as much pleasure as seeing people standing up for themselves and their neighbours. If we had a little more of this community skepticism our country would be an even better place. Yes, this is a scam. Some months ago we saw an identical scam from a company claiming to be called “ITA Work and Travel” who were offering ridiculously high salaries to totally unqualified people in far-flung parts of the world. Recent graduates from UB were being offered senior Accountancy positions in the USA at staggering salaries. Most of the victims were offered jobs on cruise ships with similarly extravagant wages, opportunities to visit exotic places and even a “diplomatic passport”. Of course it was all a scam. The key piece of evidence was that you had to pay $350 up front. The second clue was that they claimed you had to get a US visa from the US Embassy in Pretoria, not from the embassy in Gaborone. When we saw one of these visas that had been emailed over to the victim by the crooks we could see instantly that it had been created on a computer. We also sent it over to the US Embassy here in Gaborone who also confirmed that it was a fake. In fact this scam you mention sounds remarkably similar. The same up-front payment, the same unbelievable offer of employment, the same inconsistencies. Why would an organisation like this operate from a Gmail account and not, as you say, from their own domain? Then we noticed something important. The South African phone number you saw in the advertisement. It’s exactly the same as the cellphone number used by ITA. It’s the same guy, the same fraudster, the same low-down, sneaky, scumbag crook as last time. If you feel like having some fun why don’t you spend a few thebe and send him a polite text message and let him know we’re onto him? Tell him that in Botswana we’re not quite as naïve as he hopes. Tell him what you think about him! Let’s see if we can take the battle back to him! My recent comments on Success University provoked a reaction. Someone claiming not to have any real interest himself in this pyramid scheme has now sent me a total of nearly 1,500 words explaining how they are the solution to almost all of life’s problems. He attempts to justify them calling themselves a university, repeats a whole lot of nonsense about how they empower, enrich and uplift us. Blah, blah, blah. Anyway, there is news about Success University. This scheme (that’s still illegal in Namibia) which is supposedly committed to “success education” and giving people motivation has been taken over by another “network marketing company”, called Worldventure. Another educational scheme you think? No, they sell holidays. Everyone in the Success University network will now be selling holidays as well as mass-produced motivational materials. I think this shows the real nature of these schemes. The product itself isn’t relevant. What matters to them is the selling mechanism itself. What they really want is a pyramid of people selling, the product isn’t really relevant. Wouldn’t you think it strange if McDonalds bought BMW and they started selling burgers in their former car showrooms? It’s too bizarre to contemplate. I think the same goes for Worldventure taking over Success University. It tells us something about the nature of these schemes. They really don’t care about the product, they just want recruits. Our advice remains the same. By the time you hear about one of these schemes it’s too late to join and make money. You’ll be so low down the food chain that you’ll just get eaten. Only the people at the very top, the creators of the scheme and the initial members will make any money. So that $114.60 is before you have paid your expenses? Steer clear! 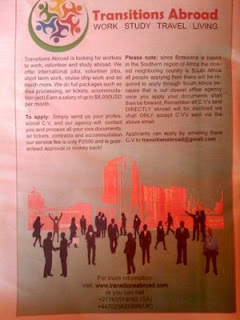 Transitions Abroad is a legitimate web site that offers advice and stories on working away from your native land. However their name is being abused by a bunch of scammers. These crooks have placed advertisements in various local newspapers advertising opportunities "to work, volunteer and study abroad". 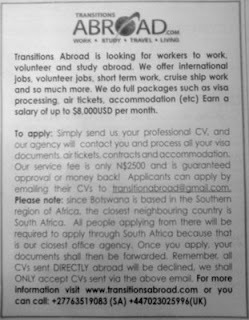 All you have to do is give them N$2,500 (about P10,000) and then you get a guaranteed job in some far-flung, exotic location. They carefully point out that you shouldn't contact the real Transition Abroad people and should only use their Gmail account. This is a scam. Firstly the cellphone number they give is the same as the ITA Work and Travel scam we exposed in our Consumer Watchdog column in Mmegi and which was reported in Monitor. Secondly the real Transitions Abroad people have confirmed that they have nothing to do with it. They say that they "are in no way connected to this scam". Give these crooks a miss if you want to hold onto your money! We’re beginning to have some success combating scammers. Not a huge amount but it’s a start. The email then contained a link to click on which would supposedly allow you to “verify” your account. The spelling is always a good start with an email like this. For some strange reason scammers don’t seem to know how to spell-check their emails. No real bank would issue an email like this containing such bad English. Then of course there is the other obvious clue. This customer didn’t even have a bank account in Nigeria. The link in the email is now unavailable but I wonder how many people clicked and opened a form that demanded their personal banking details. Luckily this consumer was smart enough to realise that this was a scam. I hope everyone else also knows that no bank ever contacts you this way. Only a crook does this. This is outrageous. It’s also a deception. If what you say is true then it’s also illegal. However, I hope your partner has now learned a valuable lesson about giving out your details like this to strangers. It’s also not the first time Prokard have been criticised for their conduct. You can quickly find a very large number of complaints on South African web sites about their approach and many of them are similar to this experience. It reminds me of certain holiday clubs that seduce people into their schemes and then they have people captive, after they’ve got their hands on their victim’s money. I suggest that you contact Prokard and formally complain about their conduct and instruct them that the payment was unauthorised and based on a deception. I also suggest you contact your bank and tell them the same thing. The lesson from this case is NEVER to give your card details over the phone unless you are 100% certain that you can trust the people you are talking to. Another lesson is not to trust telemarketers, the sort of people who call you like this. We’ll also get in touch with Prokard and see what they have to say for themselves. Maybe they’ll respond properly to this complaint and remedy the situation. We’ll see. The bigger lesson is to distrust part of this whole industry. Of course there are perfectly respectable loyalty schemes that are issued by companies like airlines who give you air miles or points based on how often you fly with them. There are also loyalty schemes run by hotel chains that work the same way. Every time you stay with them you get points and eventually you get something in return. The critical thing is that these schemes are free. The Prokard scheme is not free. You give them over R1,000 just to join. Only then do you get some cheap hotel stays. Here’s a free tip from Consumer Watchdog. If you want to stay in a hotel in South Africa use the Bid2Stay web site (www.bid2stay.co.za) instead. There you actually offer the hotel of your choice what you are prepared to pay and they can take your offer or leave it. Get your offer right and you can save a small fortune. I’m not exaggerating but I personally have saved thousands over the last couple of years this way. Before you ask, no you DON’T have to pay anything up front. And no, I’m not a Bid2Stay shareholder. Yet again the lesson is to be sceptical. Don’t trust strangers with your money and don’t give it away over the phone. Strangers who offer you something intangible over the phone in return for your cash simply can’t be trusted. On the 29th October 2008 I bought a VW Passat 1.8T, 2003 model from Popwind investments t/a Pula Motors for P65,000. The car was serviced by the same garage on the same date and I drove it from the 29th October 2008 till December 21st 2008 when I experienced a breakdown on the Francistown road. I tried to call the garage owner known as Mike on the same day, but I could not get hold of him. I had to get a breakdown car to take the car back to Gaborone for which I paid P3,000. After few days I got hold of Mike and told him the whole story about the car and he told me that he cannot help me, the car is mine I should fix it myself. I didn’t like this, so I kept calling him and his answer was the same. I went on to fix the car at another garage in Gaborone and it cost me P20,000 to repair. After all the repairs, I went back to Mike and asked him if he can meet me half way, he started telling me his personal problems and that he cannot help me. I am looking forward to your help on this case for I feel that I have been mistreated. There’s always a risk when you buy a second-hand car. If you’re not an expert it’s very difficult to tell exactly what you’re being sold. That’s why we always suggest that whenever you look for a second-hand car you should take an expert with you. In your case it might depend on what you signed. Did “Mike” ask you to sign anything that confirmed that you had waived your rights as a consumer? If you did then you might not have any way to get anything back from him. However the Consumer Protection Regulations make it clear that you can only waive your rights if you have “specifically consented” to do so. However you must understand that the car was 5 years old, you can’t expect it to be in perfect condition. However you CAN expect it to be in a fair condition for a car of that age, unless you were told to the contrary. We’ll get in touch with Mike and see what he has to say for himself. Meanwhile I think you should write him a letter explaining that he sold you a car that was not of merchantable quality. Make it clear to him that you know your rights. Maybe that will make him see sense and he can come to some arrangement with you. I took my Mazda 626 to Korean Auto in Francistown to be serviced in November 2008. On 20th December I went with my wife to collect my vehicle but they told us that the price on the original quotation they gave us had changed. Because we had not agreed the new price we only agreed to pay P5,400 which was the price they had quoted. On 24th of December on a journey from Orapa to Gaborone steam started coming from the car. We stopped the car and noticed that a lot of water was coming out on the car. In January Korean Auto towed my car back to Francistown to investigate what could have caused the damaged. I strongly believe that the reason my car had broken down was due to the fact that the garage had not done a good job so they were to investigate and let me know what caused the problem in my car. When I realized that the garage was taking a long time to inform me about their findings I went to Francistown to find out what was happening and when I got there I was given an invoice of P7,384 dated 20/01/2009 and no feedback of what caused the damage to my car. I think Korean Auto should have not charged for the second job because if they had done a good job on the first job may car would not have broken done on the 4th day. Shouldn’t I have a warranty period of more than 4 days? Yes, you probably should. However, what’s more important is that you should have an explanation of what happened. It’s possible that the service had nothing to do with your car breaking down just 4 days later but you deserve to see the evidence. You deserve to see why they are now charging you another P7,384. I suggest that you write to them demanding a comprehensive breakdown of the new invoice and an explanation of what went wrong with your car. I saw a product recall for Gonow vehicles in a South African newspaper. We approached our local supplier and according to them, this safety requirement has nothing to do with them. We are of the opinion that safety standards apply for all and this modification has some impact on us too. How does this affect us in Botswana? Who is the right authority to deal with this issue?? I’m concerned that anyone feels that a safety recall, even if it isn’t an emergency issue, is ignored by suppliers in Botswana. We’ll contact the Bureau of Standards and see if they can advise on this issue and we’ll let you know. Meanwhile if you have a Gonow vehicle be extra careful when refuelling. The email is in italics, my response at the end. I wish to commend you on the consumer informative work you do through The Voice newspaper. Your honest passion and enthusiasm to give correct information about our legal rights and obligations as consumers is just so inspiring. In your last issue of Consumer’s Voice of The Voice for Friday, July 10th, 2009, you discussed bogus educational institutions including Success University. You described Success University as a pyramid scheme which must be declared illegal in Botswana, learning from our Namibian counterparts. You say people should steer clear of it to avoid falling “victim.” You say it is “NOT” a university because they don’t award qualifications, don’t employee lecturers and don’t have premises. I know you have done your research. So you are not speaking from without. What I therefore think you need to do on this one issue is just to open your mind a little more and embrace the educational innovative idea that Success University is. To begin with, we each need to be honest with ourselves and admit, for our own good, that the conventional education that I am using to write this letter, which you are using to read it, which education earns you and me a monthly salary, lamentably falls short of the education we need to live the kind of lives we really desire as human beings. We all desire to be happy, feel purposeful, passionate and contribute to the betterment of our planet. This you do best by following your dream, or doing what you love or are passionate about. And there is nowhere on earth, no school, no university, no kgotla, where you can get this education apart from motivational, self-help, personal development or inspirational speakers and materials. And that is what Success University is offering. I would expect that you would encourage people to flock to it and learn more; because you want happy consumers. I am sure you are not a stranger to people’s stress and frustrations that come from them doing jobs they don’t like (or even hate with a passion) as a result of their conventional education. Any HR person or supervisor will tell you that motivating employees is a depressingly daunting task. Would somebody who loves what they do need any motivation? If you don’t like it being called a university, what other fitting name do you suggest? ‘University’, ‘college’, ‘school’, ‘academy’ etc are common words for places of learning. Success University is a place of learning. A book, a CD, a DVD, an article (like this one), a newspaper column (like Consumer’s Voice), etc are all lecturers. A website, with genuine people behind it who do not claim to be other than they are, is a premises. In your wildest dreams, what qualifications can you award for “success education.” Qualifications are awarded at the end of a course or program. Success (joy or happiness) is a life time journey. It CANNOT have a qualification. When you call Success University a pyramid scheme you are misinforming people. You are discouraging them for something that is good for them. Generally pyramid schemes are scams and Success University is not a scam. It is a very legitimate and innovative idea to give people something live has NEVER given them - an education in success – not in Law, Mathematics, Science etc. Of course they require registration fees, and monthly subscriptions for one to use their materials and there is nothing wrong with that. University of Botswana does it. IDM does it. All universities do it, although some prefer lump sum and installment payments. But then there is more. Success University pays you commission for recruiting other students, which creates what you are calling a pyramid, although I would rather you call it a network because that is what it is. Just like Network 21 or Amway, which are legitimate businesses organized in a ‘pyramid scheme’ fashion. I am not a member of Success University, but in my own investigations, I can advice you and your readers that it is genuine. I have seen the debit card they give members to withdraw their commission fees from anywhere in the world and I have seen with my own two eyes the monthly statements of accounts they send to the members. So please encourage people to join. Just emphasis this to them; you only make money by sales commissions (which is normal business practice) i.e. recruiting other students. If you are not a good marketer then you will be feeling the pinch of paying monthly subscriptions, which the last time I checked was I think $58.00. If it is just motivational materials you want I would suggest you use that money to buy a motivational book or CD from Exclusive Books at Riverwalk, Amazon.com or give me a call. Thanks for taking time to read this letter and I hope your readers benefit a thing or two. Thanks for getting in touch and taking the time to express your feelings. However you don't appear to address any of the issues in the article I wrote. Why does Success University call itself a university when it clearly isn't one? Are SU accredited by any educational authority? No, they're not. It's not up to me to say what they should call themselves but calling themselves a university when they are clearly not such a thing sounds remarkably like an attempt to deceive people, don't you think? When they paid me a visit to defend themselves even their local head John Keogh couldn't justify it. He also told me that the Bank of Namibia were going to reverse their decision to declare SU a pyramid scheme. When I spoke to the Bank of Namibia they denied this completely. As far as I know they remain illegal in Namibia and rightly so in my opinion. He was either mistaken or lying. You're not really serious when you say that the Consumer Watchdog newspaper column is a lecturer, are you? And that a web site constitute premises? I see no reason to change my opinion of "Success University". They are a business that uses the sale of third-rate motivational material to cover up a pyramid scheme. The more people that understand this the better. I have enormous respect for people who study for higher qualifications and for the universities that they attend. That’s one of the reasons that I am so outraged when I see the whole fake qualification industry at work. In the last couple of weeks I’ve been offered the opportunity to fast-track qualifications by a number of fake educational establishments. The so-called “University of SouthCentral Los Angeles” and the “Northern Ireland Institute of Business & Technology” both offered me the chance to get a doctorate for money. Neither of these institutions queried my previous qualifications or my ability to study at such exalted levels, all they were interested in was my ability to give them the cash they wanted. You may think that nobody would be fool enough to buy one of these fake “qualifications” and get a job as a result. However I know of three organisations in the couple of years that have found themselves employing senior managers with fake degrees. The problem is that so few Human Resource managers take the time to check the qualifications of the people they recruit. They don’t check whether the qualifications are from real universities and I suspect that in most cases they don’t even check that those from real universities are genuine. We’ve warned readers of Mmegi on several occasions about some of the companies that masquerade as educational establishments. Success University is a good example. They call themselves a university but they’re nothing of the sort. Instead they’re a pyramid scheme that entices people to join initially with their ludicrous motivational and “educational” materials but really they just want people to join and recruit other people beneath them. I also disapprove of legitimate universities being abused by people on a mission to deceive. I saw a link on FaceBook to a seminar that is running on 11th July at the University of Botswana. It styles itself as a “Business Opportunity Meeting”. It asks the question “Wonder why you work so hard but don't earn enough money to truely enjoy life?” Suspicious yet? Yet another pyramid scheme. But what are they selling? On their page they have a couple of short videos in which a Oriental man apparently demonstrates the amazing effects of the “energized water” they claim can give you greater strength and wellness. In one of the videos he gets a group of men to lift another off the ground but they fail to do so. He then (and trust me, I’m not making this up) sprays them with “energized water” and miraculously these men can now lift him off the ground. A miracle? No, it’s rubbish. It’s all utterly ludicrous. If you do a web search for “energized water” you find all sorts of nonsensical claim about it’s amazing health benefits, including, yes, you’ve guessed it, that it can help people with AIDS. In fact the only true thing about “energized water” is that it’s water. Just plain water. Nothing has been energized. If you dig a little further you find that he represents a company called QuestNet that offers a range of silly products including “the internationally sought-after Amezcua Bio Disc and Amezcua Chi Pendant… [which] focus on enhancing the natural properties of water as well as the human body’s energy systems”. Do I really have to say how ludicrous this is? Before you wonder, yes I HAVE written to UB suggesting that allowing pyramid schemes to sell crap undermines their reputation as a respected centre of learning. I earnestly suggest that you give this workshop a miss. It’s selling nonsense and a nonsensical business model. You’re never going to make any money from it. We consumers really have to be vigilant these days. I genuinely suspect that there are more people out there trying to sell us nonsense, pseudoscience and scams than ever before. It’s all the internet’s fault. The internet, wonderful though it is, allows a massive variety of charlatans and crooks to make contact with us a million at a time. Even if only a few of that million fall for their scam they make lots money. We consumers need to show the charlatans who come to trick us the quick route back to the border. Roy and all the other members of the team at Café Dijo for incredibly good service, food and coffee. I saw an advertisement on the Internet from the University of SouthCentral Los Angeles offering qualifications and scholarships. I went to their web site and filled in the form applying for a scholarship and they emailed me saying that they were offering me a scholarship. They say that for a PhD I only have to pay $850 instead of the usual $10,800. Now I’m suspicious. Do you think they are serious? Yes, I think they’re serious. They are serious about taking your money and offering you a worthless qualification. No real university in the world works this way. I did a little research into this supposed university and found a few things you might think are strange if it really is an authentic university. For instance wouldn’t you think a real university would say where it actually is? Wouldn’t it give a physical address? Even those universities that cater for distance learning students at least have an office somewhere. Not these people. Then, when I dug a little deeper I found that someone else had done some investigation already and found that their web site is partially registered to an address in London, UK, which is also strange for a university that’s supposed to be in Los Angeles, don’t you think? We did a small test. While we were visiting the USLA web site we also applied for a scholarship using three different email addresses and guess what happened? Every one of them was also awarded a scholarship without any checks, all for the same $850, without ever having to prove previous qualifications or even our identity. As far as I can see this is NOT an accredited establishment and any qualifications they award will be completely worthless. I’m sorry, but this is a scam. Don’t waste your money. I saw an advertisement in the Daily News from the Northern Ireland Institute of Business & Technology. It offered a Bachelor of Business Administration degree “leading to MBA / PhD / DBA Degrees” by distance learning. However the email address they gave was in Malaysia. How can a school in Northern Ireland be in Malaysia? Good question. Of course it’s possible for a college to have the name of one place but operate from another. However it is a little strange in this case. It’s also strange that they have a web site that appears to be based in the UK (www.niibt.org.uk) but they give a contact email address in Malaysia. When I dug further on the internet I discovered that the web site is in fact registered to an address in Malaysia as a “Non-UK Corporation”. What are they trying to hide? Then there’s more. Using an assumed name and free email address I contacted this establishment and asked if I could study for a PhD. I told them I already had a Masters Degree from Calamus University, a famous fake university and wanted to progress further. Within hours I had a response inviting me to fill some forms and send over some cash. Is that the mark of a real university? The final thing I established was the geographical spread of these people who claim to be respectable. Their web site is British, their recruitment is done from Malaysia, you send the money to Malaysia but their “Business Campus” is in Ireland. Sounds confused to me. Please don’t deal with these people, they are way too suspicious. An acquaintance suggested I should buy some educational materials from her. She also said I could make money by selling these materials to other people. When I pressed her she told me that they were from Success University. I remember you have written about Success University before. Do you think I should? No, most certainly not. Success University is a pyramid scheme. Don’t just take my word for it, trust the Bank of Namibia who have declared Success University as an illegal pyramid scheme in Namibia. It’s time our enforcement agencies did the same here in Botswana. So why is this an educational question? It’s because these people call themselves a university when clearly they are NOT a university. They don’t award qualifications, they don’t employee lecturers and they don’t have premises. They are lying about being a university and using the term to gain some credibility with their victims. What in fact you get from this organisation is a variety of mass-produced motivational material, from a variety of evangelical speakers. What they want you to do of course is become a reseller yourself and then to recruit other people beneath you. Can you picture the pyramid shape yet? Steer clear of these people. Sooner or later our authorities are going to act to put these crooks out of business. Consumers of educational services have to be VERY careful these days. Employers have to be even more cautious. Many, many educational establishments are out there awarding worthless, non-accredited qualifications. Although many employers fail to check the validity of the qualifications of their recruits many do and sooner or later, even if you get a job using a fake qualification, you’ll get found out. In our work with large organisations we’ve identified a several employee with fake degrees and on every occasion they’ve been disciplined or fired as a result. Don’t take the risk, be careful before you start studying. 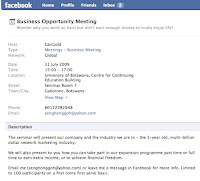 A Malaysian called Goh Seng Hong is in Botswana trying to introduce us to GenQuest, a Multi-Level Marketing company. He's doing a presentation at the University of Botswana on 11th July. Posted on the Facebook site for the event are videos relating to "energised water" whcih of course is pseudoscientific claptrap. 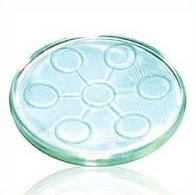 When I contacted the guy he was rather defensive, accused me of a range of sins, but eventually confessed that the product they are selling is the Bio Disc. This is a very good example of the sort of Energy Medicine nonsense that abounds these days. However, the real product on sale is "network marketing". It's a pyramid-structured selling mechanism where the recruits are promised wealth and happiness by recruiting other people into the scheme beneath them, each level making money from the levels below. Very few people make money from network marketing other than those at the very top.